I was given an awesome opportunity from My Blog Spark and General Mills to try four boxes of General Mills cereal for free. I have four kids in my home and also run an in home daycare. I go through A LOT of cereal!! It is a quick, easy, and cheap meal. Ready-to-eat cereals, including presweetened cereals, account for only 5% of sugar in children´s diets. Ready-to-eat cereal is the No. 1 source of whole grains in a child´s diet today. I chose one of the cereals (honey nut cheerios) and I let each of my older kids choose what they wanted (lucky charms, cinnamon toast crunch, and cookie crisp). I was not afraid of them to by the "treat" type cereal because of the new formula they have. One study of 16,000 adults revealed those who skipped breakfast tended to weigh more than those who ate breakfast. So Thank you very much to General Mills and My blog spark for this wonderful opportunity. I will defiantly keep buying these cereals! Well after a long break(thank you) I am finally back. Major family issues hopefully out of the way *crossing my fingers* I am ready to come back! How to make some extra $$$ in time for Christmas! My Points - Clicked on links in emails for a total of 95 pts. I have been a member of MyPoints since 2005. It is so easy to earn rewards with them. My favorite way is by reading their paid emails. You earn 5 points per email. And it adds up really quickly! You also earn points by shopping with popular merchants like Walmart and Target (you must use their link on their site when you make your online purchase). You can even earn points on your Ebay purchases! Reward Port - Clicked on links in emails worth a total of 243 points. (I did not do any point earning offers.) I have 2498 points. I need 7500 to get a $25 gift card to Walmart. Survey Head - 4 screeners. 1 survey worth $1. You need $25 to cash out. You get a $5 bonus for joining. Send Earnings - Get paid to read emails and take surveys. Each day you can participate in a new survey that generally pays $.50 and takes 3-4 minutes. Today, I participated in a Send Earnings survey about a new movie. I was asked to watch the trailer and give my opinions. ~You get a $5 bonus when you sign up. ~Refer your friends and you get 10% of their earnings. You’ll receive a check by mail each time your account reaches $30. Super easy. Swagbucks - Won $1 (in Swagbucks) this morning. I need 45 to get a $5 gift card to Amazon.com. YouData is a quick way to make a little change. You make money by simply logging into your account and viewing banners or ads that they have already loaded into your MeFile reader for you. What's cool is they pay every Friday via Paypal and there is no minimum to get paid. This won't make you big bucks, but it's a quick, easy way to make a little extra. American Consumer Opinion-High pay $2-$10 per survey. global test market-100 marketpoints = $5. Abundance of survey opportunities each week so lots of chances to earn! Ipsos i-say-is a great way to earn free gift cards. When you register for this panel (it's free), you'll get 2-5 survey opportunities per week. Each completed survey earns you points that you can redeem for gift cards from places like: Applebees, Chilis, Olive Garden, Amazon, Kohls, Pier 1, and dozens of other places.Other perks: you'll earn an entry into a $5,000 drawing for every survey you complete. You can also occasionally qualify for product testing. Free products are sent for you to try, and then you earn points to share your opinion of them. Lightspeed Panel - I just love this site. Everything gets two thumbs up. Plentiful survey opportunities. High pay. And best of all, you can opt to be paid via paypal or (my favorite) restaurant gift cards, including Cracker Barrell, Chilis, TGI Fridays, Applebees, Red Robin and Olive Garden. A screener is when they ask you questions to see if you qualify for the paid survey. Elizabeth won Lauries Mineral Makeup!!! Sorry it took so long to put up! I have been a little busy!! Elizabeth email me and let me know where to send this trio! Have you heard about YOUDATA? This is an amazing new program out there. Since it is new you do not get paid very much; however, you are paid EVERY week. No matter how little you have made. My first week I only $0.09!!! That is it, however, I still got my Paypal payment. This is a SUPER EASY site also. All you do is set up your account and fill out the short surveys(i suggest doing all of these). Then the youdata company "sells" your information(like what kind of drink you like) to a company. That company in turn sends you their ad to view. You are paid to look at their ad! How easy is that?!?!? They also have a great referral program. You get $1 for every referral and those are paid along with your weekly earnings! How easy would it be to get people to sign up for something that is this simple! Are you using Swagbucks for your Internet searches yet? You should be. I signed up for Swagbucks and in two weeks I had $10 amazon gift cards!! It was recently announced on the Swagbucks Blog that starting on Black Friday ~ November 27 ~ and running through January 1, they will offer a different gift card every day at a drastically reduced price. There’s no way to know which cards are the bargain of the day, but you can bet I’ll be checking the Swag Store frequently to cash in on some deals. Two of the bargain cards can be snagged each day. 1.I downloaded the Swagbucks toolbar. That makes it super easy for me to remember to use. If you don’t search with Swagbucks, you don’t earn points! 2.I tell people about it. A very high percentage of my Swagbucks come from people who have signed up with my referral code. As each of my referrals wins their first 100 Swagbucks, I get 100 duplicate bucks posted to my account. Blog about it, post your referral link on Facebook, email your friends and family. My good friend Laurie has given me the opportunity to run a contest to win her mineral makeup. I have been using Laurie's makeup for over a year now and I can not tell you how great it is!!! And the other great thing is it is not as expensive as it is in Dept. stores. You can not go wrong. 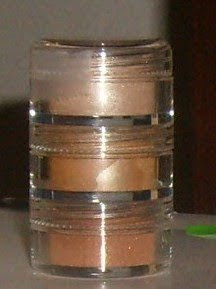 This is a mineral eye shadow in 3 shades of "warm brown". 1) Go to Lauries site and look through her makeup line. 2) Make a comment on this post saying what kind of makeup(color, or type) you would buy from her. 3) Sign up as a follower on this blog. My name is Carrie. I am a mother of 4 children on earth and two in Heaven. I have been married to the same wonderful man for 6 years. I have been a full time stay at home mom for just about 2 years now. 2. I wanted to be able to help other people out there. 3. I wanted to be able to meet all of you wonderful people. Please feel free to drop me a line. Let me know if you want to see anything special on here or if you would like to write a guest post.